For more than 60 years, The Critical Thinking Co.™ has proudly donated hundreds of thousands of materials to charities, institutions, and children in need. Thanks to suggestions from customers like you, our philanthropy program has grown to new heights. Every year Critical Giving donates thousands of educational products through our non-profit partners to children living in the U.S. and abroad. We are incredibly proud and honored to have the privilege to help so many children, it is truly humbling. Their success stories continually inspire us to keep on empowering the minds of children around the world. Thank you for making this possible. You can help give critical educational materials to those in need simply by shopping at www.CriticalThinking.com. In addition to Critical Giving, a portion of every order is donated to the John David Baker Memorial Scholarship Fund for less privileged children, in honor of the company's founder. Our family-run business donates award-winning products to educational and charitable institutions such as Kids In Need Foundation, Gifts In Kind International, First Book, and many others. Let us know your favorite charities and we may add them to our non-profit partner list. The Critical Thinking Co.™ donations to schools and charities include national award-winning titles such as (but not limited to) Mathematical Reasoning™, Scratch Your Brain®, Language Smarts™, Red Herring Mysteries, Reading Detective®, Editor in Chief®, Mind Building Reading, Complete The Picture Math, Word Benders™, and many more. Full Disclosure: We donate digital access to our materials in addition to physical hard copies of books and software. This allows us to reach more schools and children, and provide each child with several mind-building options. According to a study published in 1998 by the The David and Lucile Packard Foundation, "Virtually all of our nation’s children have access to computers at school, and over two-thirds have access at home." Granted, schools serving predominantly low-income children tend to have older, less functional computers, and fewer computers in each classroom as compared with schools serving higher-income children, but the fact remains, most low-income students in the U.S. who want them now have access to the Internet and other digital learning resources. Inspired by life-changing organizations, such as One Lap Top Per Child (OLPC), Computers for Kids, Computers for Families, First Chance Project, Juno, and NetZero, helping to make free web access and online learning possible for the less privileged, The Critical Thinking Co.™ now provides digital donations (along with physical hard copies) to give to schools and children on a much larger scale. 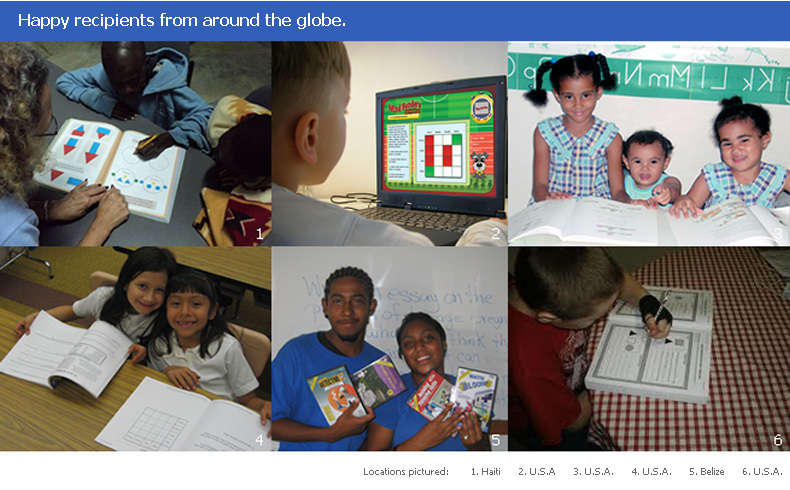 Internet access abroad by children in need is a much different story. For this reason, we work with international humanitarian non-profits to deliver thousands of physical books to children in need; however, children in the United States receive the bulk of our donations.